Spring has sprung and there are beautiful blooms everywhere - even in the Flickr Embroidery Pool. This mosaic is only part one - there are so many lovely examples that this is only the beginning!! 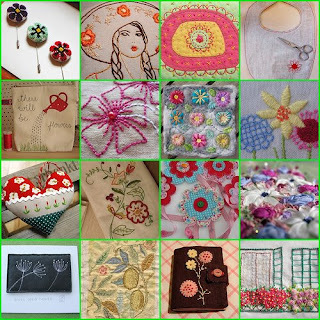 So grab those spring colored flosses and stitch a bouquet for yourself - I know you'll be inspired once you see what other stitchers have done - enjoy!! ONGosh! what a nice collection. Thank you for taking the time to compile them. You are right about inspiration! Hey! Just came to have a look at what was new today, and imagine my surprise and delight to see one of my pieces included among all this terrific work! Thanks!! hi, I've just found your blog and it's great! I will be back to read more, I love your selections.